There are so many traditional Indonesian games that you can find. 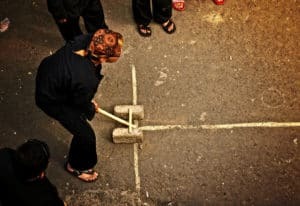 Below are some of the most popular traditional Indonesian games that you can find these days. 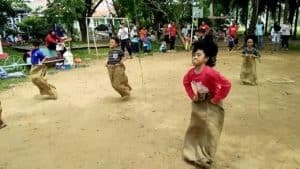 Balap Karung or sack race is one of the most popular traditional Indonesian games. This game is not only played by kids but also by adults as well. This game is commonly played when celebrating Indonesia Independence Day that occur every 17 of August. 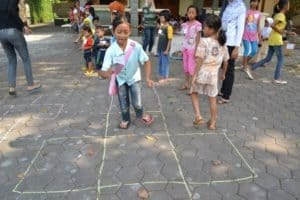 This traditional game is also considered as one of the oldest of traditional Indonesian games. Some people even said that this traditional game has been played since colonial era in Indonesia. In this game, the players will race from the start to finish line by wearing sack on their feet. Bentengan or Fort Game is also one of the most popular in traditional Indonesian games, especially among boys. This game focuses on strategy and agility in avoiding or catching the opponents. This game became more rarely played these days. Some people said that this game is representing the struggle of Indonesian people when fight against the colonialist in the past. Bola Bekel is traditional Indonesian games that is quite similar to the Jacks game. This traditional game is commonly played by girls. On the other hand, girls usually spend quite long period of time to play this game. Meanwhile, to play this game, you need a ball that is called Bekel Ball and ten jacks which are called Kuwuk (small sized seashell). This game can be played by three to five players. Congklak is also a traditional Indonesian games that became very popular. Thus, this game is played by using board with very unique and exotic design. This game became very popular in Indonesia after people from Middle East came to Indonesia. Egrang is traditional Indonesian games came from West Java. Just like Balap Karung, Egrang is also commonly played during the celebration of Indonesian Independence Day. This game will test your balance. The history of this game is quite unclear. 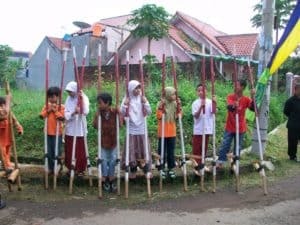 Egrang is a traditional Indonesian games which played by using two bamboo poles. Each bamboo pole is 4 to 5 meters high. About 50 cm from the bottom of the bamboo poles, there is a step where the player can put their feet. Then, players will use these bamboo poles to walk from start to finish line. Engklek is a traditional Indonesian games usually played by girls. It also known as Taplak. Some people said that this game came from British while other people might say that this game has existed since the 17th century in Rome. In Indonesia, this game became popular since the colonial era. This game can be played by three or more players. In this game, several boxes that are connected to each other will be drawn on the ground. The shape of the boxes may vary. The players are required to move from one box to another by using only one foot. Gobak Sodor is also a very popular traditional Indonesian games. In some regions, this game is called Galah Asin. This game is still played these days in various ceremonies. Then, this game requires the players to have good strategy and agility in avoid the opponents while running through the lines that are guarded by the opponents. This game is played by two teams. Each team consists of 4 to 5 players. One team will guard the lines and try to catch the players that run through the lines while other team will try to run though the lines without being caught. This game is known as spinning top in other countries. However, Indonesian spinning top or also known as Gasing has quite unique characteristics compared to other types of spinning tops that came from other countries. This game is usually played by boys. Originally, this game is played by using egg. But these days, Gasing is made of bamboo or wood. The goal of this game is spinning the Gasing as long as possible. Player with Gasing that is still spinning will win the game. Gatrik is a traditional Indonesian games played by using two thin bamboo sticks with 30 cm and 15 cm long. Other tool that is used in this game is two bricks that are used to support the bamboo stick. This game is commonly played by boys. Gatrik is played by two teams. Each team consists of 3 to 4 players. This game only can be played on large field. 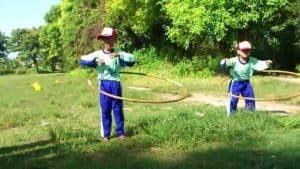 Then, in this game, one team will throw the bamboo stick and the other team will try to catch the stick. Marble are considered as one of the most common types of game that are played by kids all around the world. However, Indonesian marble might have a little bit different rules. In Indonesia, marble is called Kelereng. In some regions, this game is also called Gundu. This game is commonly played by boys. You need two players or more to play this game. There are various types of game with various different rules that you can play using Kelereng. 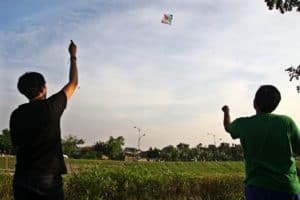 Just like marble, kite is also a common game that is played by people from all over the world. 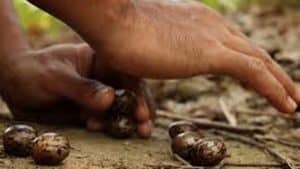 In Indonesian, this game is called Layangan. However, boys also can play this game as well. You can play this game alone or with your friends. Lompat Tali is also a traditional Indonesian games that can be found in other countries as well. 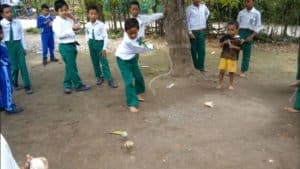 This game is known as Jump Rope in other countries outside Indonesia. Lompat Tali in Indonesia is very unique because the rope that is used in this game is made of rubber bands that are attached to each other. Meanwhile, this game can be played by three players or more. Two players will hold each end of the rope and skip the rope around. Other players will jump through the rope without touching the rope. uncang is the nut of rubber plant. Since rubber plants only bear fruit in certain season, this game is also seasonal as well. This game can be played by two players or more. Each player will bring their own Muncang and they will try to break other players’ Muncang using theirs. The player that can break other players’ Muncang is the winner. 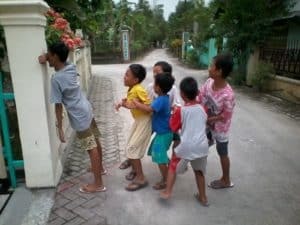 This game is commonly known as Hide and Seek in other countries outside Indonesia. 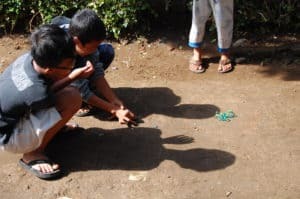 In Indonesia, this game is played by many kids, especially in rural areas. In this game, a player will close his/her eyes and count while other players will find spot to hide. After that the player who closes his/her eyes will try to find other players one by one. 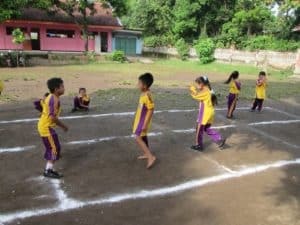 Those are some traditional Indonesian Games which still played by children, especially in rural areas. Moreover, most of them are recognized as Indonesian Heritage that its existences must be kept for long lasting term.